Take a moment to picture a chemist’s research tools, and you might imagine microscopes, beakers and Bunsen burners. But when it comes to theoretical and computational chemistry, researchers prefer a different instrument: the supercomputer. The University of Minnesota’s most powerful supercomputer is giving researchers new ways to simulate the way molecules move and interact — and in doing so, advance research around how matter behaves at the atomic scale. Mesabi, which arrived at the Minnesota Supercomputing Institute in April, opens up new possibilities for compute-intensive research. At a speed 3,864 times faster than a typical personal computer and with 8,700 times the memory, Mesabi is ideal for a wide variety of large, computationally intensive research projects. 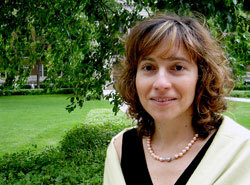 These computing resources have allowed U chemistry researchers like Laura Gagliardi, Ph.D., a professor with the College of Science and Engineering, to conduct compute-intensive research using complex computer modeling programs. To simulate the behavior of molecules, researchers have developed software that can follow both the laws of classical mechanics — the normal laws of physics that explain how objects move — and quantum mechanics — the science that explains how matter behaves at the most microscopic levels. These programs require a fast system with large amounts of memory to compute, and even on a supercomputer like Mesabi can take several days to complete. One example of supercomputing in chemistry is Gagliardi’s ongoing effort to develop a material that can remove carbon dioxide from the exhaust given off by power plants. “Carbon capture,” as the process is called, can help lower harmful emissions and improve air quality, but current methods of doing so are expensive. The challenge is to design more efficient methods of capturing carbon. A new set of lab-made materials called metal-organic frameworks could provide the solution. With slight tweaks, these materials can be made to behave in an enormous number of different ways. One of the more prominent uses is for gas separation — such as pulling carbon dioxide out of exhaust. By running modeling programs on Mesabi, Gagliardi can efficiently examine hundreds of thousands of these variations, not yet synthesized, to see how each would interact with carbon dioxide. Another way the supercomputer fuels chemistry research is in the designing of new materials to serve as catalysts — the materials whose presence can spark or accelerate a chemical reaction, but that are not used up in the reaction itself. Gagliardi and her team are focused on how catalysts can be used in reactions that manipulate natural gas. One project, for example, involves designing a new generation of catalysts for transforming natural gas into liquid. Natural gas that is trapped within shale rock formations in the ground will release fewer emissions if miners are able to transform the gas into a liquid. Right now, the most effective catalysts used by industry are based on precious metals, such as platinum, palladium and rhodium, which are rare and expensive. Gagliardi is now performing computer simulations of known catalysts and working to understand what mechanisms make them function the way they do. Researching alternatives not only expands chemists’ knowledge of the behaviors of matter, but could provide a less expensive solution to a real-world problem. “We are modeling these precious metals to understand how they function as catalysts,” Gagliardi said. Both the catalysis and carbon capture projects are funded by the U.S. Department of Energy’s Office of Basic Energy Sciences. Modeling the behavior of molecules plays an important role in chemistry. The work of theoretical and computational chemists, like Gagliardi, goes hand-in-hand with that of experimental chemists — researchers who conduct chemical reactions in labs and observe their results. The two groups of chemists team up on projects to test hypotheses and gain new knowledge. While laboratory experiments are a crucial part of research, it can sometimes be difficult for scientists to know what’s going on at the atomic level when they observe a chemical reaction taking place. Some steps of the reaction may show no outward sign of change or may take place too quickly for researchers to study them. Using the modeling capabilities made possible through the U’s supercomputers, researchers can better understand the properties of matter at the atomic scale while also shedding new light on how these materials can help improve our world.